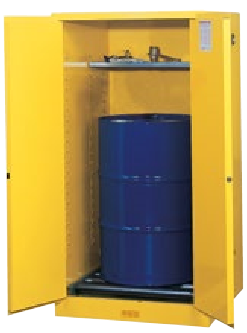 Use these vertical drum safety cabinets to safely store 30- to 55-gallon (110- to 200-L) drums. The removable, adjustable, half-depth shelf provides enough head space to accommodate a drum with a pump or funnel so the cabinet can be used as a pumping or waste accumulation station, and also allows you to store Class III materials or spare accessories. Available with or without roller assemblies to easily move heavy drums. FM approved.